Social entrepreneur and Kenan-Flagler Business School instructor Jim Kitchen introduced himself to Sam McAdoo on Monday in about the nicest way possible. McAdoo is the fourth lucky recipient of a free car over the past year, thanks to the profit-making skills and community spirit of some of Kitchen’s UNC students, and the support of Community Empowerment Fund. Sam McAdoo has finished Community Empowerment Fund classes on budgeting, saving money, and other skills. He’s proven himself to be free of a destructive lifestyle, and he’s working toward certification for a career in truck driving. Maggie West is the program coordinator for Community Empowerment Fund, which works with people who are either homeless, or living at the edge of homelessness. She talked a bit about why McAdoo was chosen to receive this gift. That and many other aspects of McAdoo’s life have been made easier now. 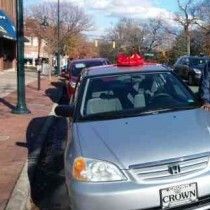 Crown Honda of Southpoint took the $7,000 raised by Kitchen’s students and came up with two nice cars. Two days earlier, another Honda was given to Equashia Mumeen, formerly homeless, and now a kitchen assistant at Granville Towers West. McAdoo’s new car is nice silver 2003 Honda Civic that looks brand-new. Walter Sturdivant is a sales consultant and internet sales manager at Crown Honda. He’s been working closely with Kitchen and CEF to get cars to deserving folks whose lives will benefit greatly from them. Kitchen said he hopes to be involved in 10 car giveaways this year.